Latest - check out details of the German Scooter Weekend! The Maico Club is a long established Owners’ Club and can trace its roots back to the late 50’s. Originating from the heyday of Scootering in the 1950’s when there were many one-make clubs, the SURREY MAICO CLUB, as the club was then known, soon built up a large membership in the 1960’s. 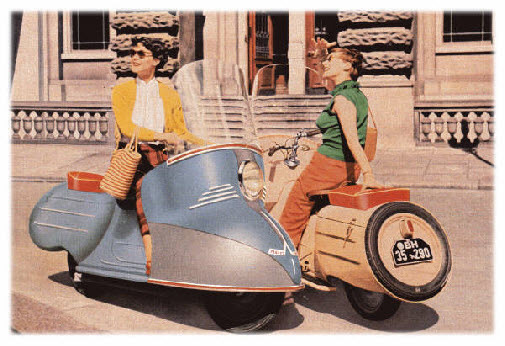 As scooter sales declined, and most of the one-make clubs folded, only the SURREY MAICO CLUB and the MAICO CLUB G.B. Still survived. By the end of the 60’s, it was decided to amalgamate both clubs and hence the MAICO OWNERS CLUB was born. Although the roots of the Club lie with Scooters, the new Owners’ Club soon catered for all types of MAICO. However, over the years the motor cycle side suffered a decline in that today almost all of the very early machines and those built in the 50’s and sixties have been exported. Club exists but caters only for the “Mobil” & “Maicoletta” scooters. Thankfully some of the original Members are still in the Club today and it is through their knowledge that the Club can help new Members. The MAICO CLUB is dedicated to the preservation and restoration of MAICO scooters. The Club also endeavours to be the platform by which all like-minded enthusiasts around the world can keep in touch with each other.